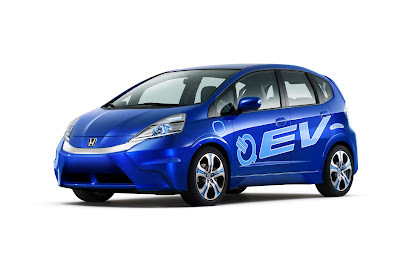 Honda Motor Co., Ltd. today began lease sales of the Fit EV to local governments and businesses in Japan. The Fit EV, comprehensively pursuing the potential of electric vehicles, origins back to the EV Plus that was introduced in 1997 for lease sales. In this new electric vehicle, Honda applies its latest technologies and ideas cultivated through research and development of electric mobility products including electromotive powertrain technologies used for the latest hybrid and fuel cell electric vehicles. The Fit EV was developed as an electric vehicle that is fun to drive, yet can be used smartly. The development team adopted two key words - “Fun” and “Mottainai” (no waste) - and strived to 1) create a vehicle with greater range requiring less battery capacity, 2) further pursue motor drive performance, and 3) eliminate any waste of time during battery charging and other areas. To achieve these points, Honda adopted a basic package of the Fit with its compact body size and occupant comfort and planned the maximization of the energy efficiency of EV. As a result, the Fit EV has achieved world's best*1 AC energy consumption rate*2 of 106 Wh/km and one-charge mileage of 225 km in JC08 mode. Furthermore, the Fit EV features functions to charge the battery or obtain information through the information and communication system. Honda plans to lease approximately 200 units of the Fit EV in the next two years, mostly to local governments and businesses. *2 Calculated based on the traveling distance and the amount of AC energy (alternating-current power) required to charge the battery. The AC energy consumption rate used for the calculation was measured under the conditions required in Japan, and the actual rate will vary depending on the environment where the vehicle is used and how the vehicle is driven. *3 Time required to charge the battery to 80% of capacity after the low battery power warning light comes on. *4 Time required to fully charge the battery after the low battery power warning light comes on.